Around November 2010 a dealer for Eldorado National brought an EZ rider BRT to show the University at Buffalo (UB). UB liked it and ordered 28 buses, which are supposed to arrive in May 2012. The demo was a 32' bus but they are supposed to be getting 35' buses. It is funny because this is the only demo they looked at. Maybe because who they are buying the buses from. The system is contracted through First Transit who inherited it when they bought out Cognisa Transportation. According to the assistant director of parking and transportation, UB signed a ten year contract with First Transit starting in May. Right now the fleet consist of 24 2005 BlueBird 38' All American RE buses. They also have 3 Xcel 102 40' buses originally from LSU. Those are used as spares along with a 98 CSRE 40' bus. All buses have CAT C7 engines except the CSRE which has some type of Cummins engine. And as you probably guessed the transmission is a Allison 5 speed. Good riddance!!!!! I saw some of those hideous "buses" running around on the weekend and was not the least bit impressed. Ironic that the first time I really notice them comes right before I read about their replacement. The first few buses have been built. I am trying to get the picture of it emailed to me. Right now they are all blue with white painted steel rims. Amber twin vision destination signs. The engine is a Cummins ISB 280 (demo had an ISL) with a B300R 5 speed. The windshield is a BRT two piece. The ramp is installed in the rear door. Thats pretty much the main stuff, but if anyone has any questions feel free to ask. They are supposed to arrive in May. The buses started delivery two weeks ago to the dealer in Rochester and one was picked up last week. Not sure when they are going to finish the ouside logo and wraps. The radio and GPS units still need to be installed along with other stuff. I don't understand why UB is going from 40-foot high-floor buses to 35-foot low-floors given the crowding on some (many?) of the Stampede runs. I don't know why. I think it did keep the cost of the contract down somewhat. The new buses are supposed to start service the week of May 13th. They brought 13 buses from the dealer in and now have a total of 14 of the 28. As of now it is undetermined what will happen to the old fleet of buses except for the Xcel102 buses which I am told will go to a First Transit location in Canada. The rest of the buses (All American and CSRE40) are non- accessible... no lift or kneeler, so there isn't really much of a need for them anywhere. Just in time for the end of spring semester. That's probably not a bad thing - give First a chance to train the mechanics and drivers over the summer and be ready to go when fall semester starts in late August. Are the remaining 14 buses supposed to be in by then? Are the remaining 14 buses supposed to be in by then? Yes... They are planning on picking up the rest next weekend. Seven are at the dealer now and have to be inspected for DOT. I hear UB plans on wrapping a few buses. Hope the wraps are not as awful as the ones that they have done in the past. Two of the Blue Bird All American buses (111 and 112) have been sold earlier this week. The buses went somewhere near Long Island. The All American buses are numbered 101-124. 109 has not been used because of a bad frame, and has been a parts bus for the last year. 108 and 102 have bad engines (bent rods) and have been out of service for the last three months and one month respectively. The new buses are supposed to enter service on the 16th, meaning the last day for the current buses will be the 15th. They still are waiting for ten more of the EZ Rider buses to be delivered, which should come Monday. Nothing has been done yet to any the new buses to get them prepared for next week. So here is a little update for the old fleet... The three Xcel 102 buses went down to College of Stanten Island (CSI). That is where bus 111 and 112 went too. Supposedly the CSRE was transfered there too. Like UB, the CSI contract was also Cognisa before being bought by First Transit. So some of their buses are pretty identical. The rest of the buses are parked, some at First Student locations. First Transit was awarded a contract with Buffalo State College. They will be using some ex-Stampede Blue Bird buses. 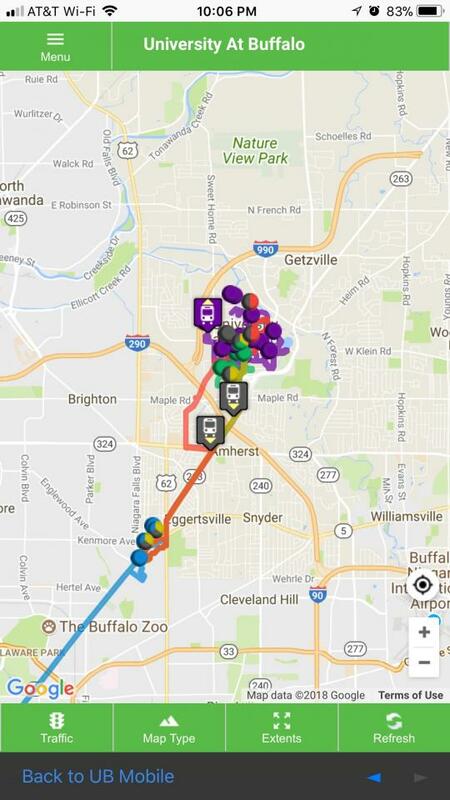 This contract will shuttle students from Downtown Buffalo to the Buff State campus, and back. Students will be living downtown while construction takes place for the new dorm complex at Buff State. There will also be a market circulator, like the one NFTA ran before. Right now it is looking like the Blue Bird buses will be used for that route as well. So the Blue Bird buses will stick around a bit longer. Visited the UB campus this past weekend - these 35-foot buses are frequently overcrowded, particularly on evening runs. The Stampede could really use some 40-foot transits. Just a quick note that I've gotten the fleet roster for 4107-4134 added to the wiki. Am going to begin working on the rest of the vehicles, namely the cutaways that I've seen over the campuses. Also note...the fleet roster begins at 4107 due to the numbers matching the last four digits of the VIN. Makes sense. I know it’s not the smartest decision to bump an old thread, but I presumed it would be better than creating a new thread. However, I’ve recently noticed an issue between Parking & Transportation and First Transit. The schedule posted by Parking and Transportation fail to reflect actual service that the Stampede is running. This is especially noticeable during Friday and Saturday evenings where UB supposedly “cut service” to prevent students from using the service to go to parties. However looking at actual service patterns, Friday bus service tends to run a lot more like a normal weekday with the addition of the North Connector. On Saturday’s I’ve noticed that there is one bus running on the Yellow line making a round trip every 30 min on top of the 20 min All Stops service. Additionally on some Saturday nights, via the tracker, I’ve seen 2 back to back All Stops (less than 5min apart) instead of the single Yellow Line bus schedule to run. While others I’ve encountered 2 Yellow Lines providing 15 min service. These inconsistencies from the schedule make riding the Stampede extremely confusing as it become difficult to predict when a specific bus will show up, and this is barely scratching the surface with some of the other problems I’ve noticed. I want something done about this but, I’m unsure of the best course of action that I can take. Thos was taken on the Saturday night between Feb 17-18. If you are a UB student, you should try and get other students together and bring your concerns to the university. From what I'm guessing, the service that's "Express" (the Yellow Line) is not well traveled, since it serves less student housing, and they made it an ALL stops trip? That extra bus would actually improve the services for all students, being that there's an extra bus to Flint and Ellicott. Also, if the buses are running off schedule due to unplanned delays, it's a lot more difficult getting someone in to cover the shift, than just making it an all-stops, and try to maintain some less chaotic schedule. Heard previous years of people referring to it as the "vomit" bus, so I betting that might be a good reason for them to run off schedule while they clean it. With all these inconveniences being the norm, it could also run down to money. If they order five buses to offer their present service, by no fault of First Transit are they required to add service to plug the gaps. It's kind of like a schedule for a city bus that gets taken out of the way for a bridge being out or a construction period. Some agencies will plug the holes that are created in the schedule, or run it with the delays in place. The problem is not many people understand the situation as a whole which makes it difficult to get peoples support. The buses in question where just 2 plain All Stops providing hourly service because of the short gap between them. While the Yellow line does have fewer riders, it's the only scheduled bus to run at that time. Now while I and most students would prefer 2 All Stops making 30-minute rounds over 1 Yellow Line making 30 min rounds, It's not reflected in the scheduled. SO essentially these act as ghost runs that no one is aware of. While most of these are actually beneficial to students, what is detrimental is Parking and Transportation's lack of awareness of current service patterns. Because at 12 am there is no ... or should be no delay in bus service. This seems to be a recurring issue that isn't being addressed. 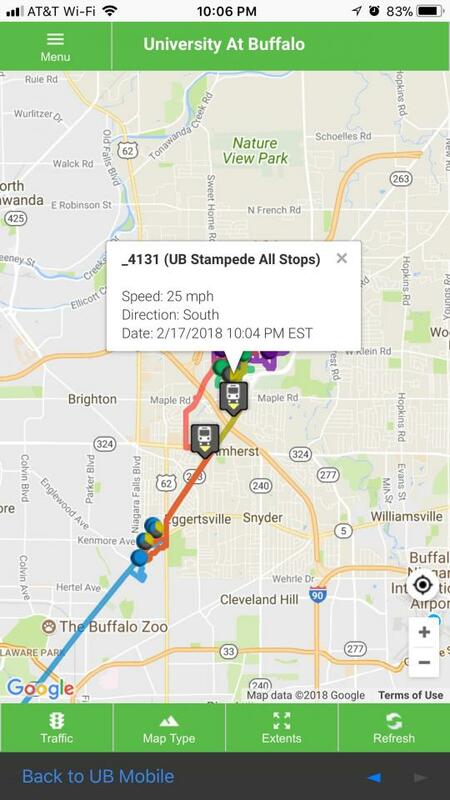 Originally with all the drunk buses UB had the tried to curb is by eliminating bus service, however, after facing severe backlash they restored it with a limited schedule. It was originally 1 Yellow Line bus to only went from Flint to South Campus, and the schedule was strictly followed. However now during the spring semester, the buses are no longer following the schedule. It seems that First Transit is running on its own internal schedule. What really makes it difficult for me to prove what's going on, in my inability to stand in the freezing cold at 2 am to prove that the schedule that Parking and transportation claim is correct is actually false. You were quoted as saying " On Saturday’s I’ve noticed that there is one bus running on the Yellow line making a round trip every 30 min on top of the 20 min All Stops service. ". Although I didn't exactly read the present schedule, there were frequent bus services in the past that let one to believe that ran every 15-20 minutes through most of the night. I assumed this was a continuation of the past schedules. 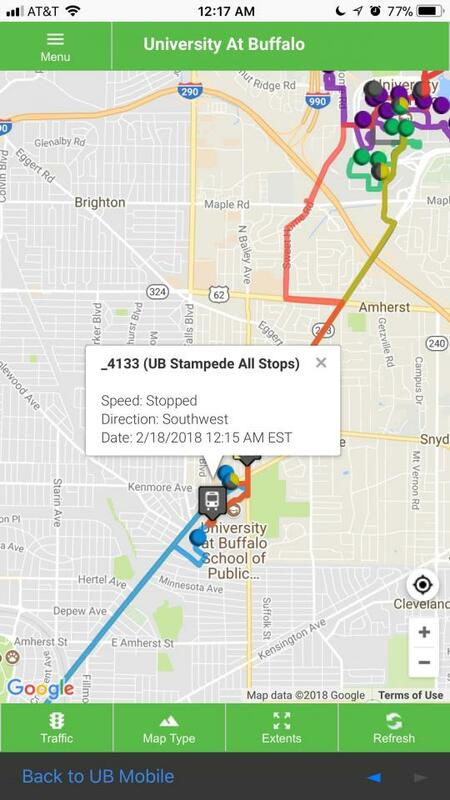 Not entirely understanding, but if the Stampede is once-hourly, and the Yellow line is supposed to run every 1/2 hour....which buses are running near the same schedule? If the two Stampede buses are running once hourly, that means there may be a 115 minute gap for a Stampede? The reason for the Yellow line possibly running as a Stampede is that there is no 115 minute wait. Not sure if I'm following, but can you elaborate more? During the day on Saturday, there are 4 buses 3 All Stops and 1 Yellow Line*. The 3 All Stops are scheduled for a 1-hour loop providing 20 min wait. However, there is another Yellow Line bus that appears to run on Saturday as well even though the Yellow Line is not scheduled to run on Saturdays. This bus makes a 30-minute loop providing 30 min wait. My son went to UB - from what I've heard, many students are unhappy with the service. Rude drivers, poor schedule-keeping leading to gaps and bunched buses, etc. I believe you'd get some attention from your fellow students if you tried to take action to address this issue. Regarding the use of 35-foot buses - weren't the old pusher buses that were used before the El Dorado's longer than 35 feet? In any event, they could get 40-foot or even 60-foot buses and assign them strictly to the Stampede from Flint Loop to South and not even have to run them through the Ellicott complex if those tunnels are a concern. The weird thing is that I'm looking at the schedule sitting in front of me, and they're confusing as hell, to start with. Being more familiar with the way Metro sets up their schedules, including the time that the bus terminates its trip....this is confusing. Looking at the Red Line having three columns for concurrent trips is even more deceiving for those not familiar with the schedules. I've dealt with a lot of the Stampede drivers, and find them actually a lot nicer that some of the Metro drivers. But, I do say my pleasantries such as "good morning", "good afternoon" or "good evening" when I get on, and saying "thanks" when I get off, instead of the common eye-roll. Went after a job in their office about a year ago, but didn't get the job for whatever reason. Hmmph, I might have been able to fix something that's wrong.